In Parting Glass is an exhibition created by choreographer Riccardo Buscarini and visual artist Richard Taylor. Together, they transform a number of glass cabinets in Summerhall’s Laboratory Gallery into living archives, exploring memory, intimacy and exposure. Ready-made objects, sculpture and sound recordings partner live and recorded performances in the space. On the opening night Buscarini enacted a live performance inside one of the artificially smoke-filled cabinets.Claire Walsh: Can you please tell me about the relationships between memory, the body and this particular space—the Laboratory Gallery. Riccardo Buscarini: When I was invited to make a work for Summerhall’s Laboratory Gallery by curator Holly Knox Yeoman, I was asked two things: to collaborate with a visual artist and to put a body in the cabinets. In terms of the use of movement and the presence of the body itself in this exhibition, my initial idea was to respond to the cabinets as archives and cages. Summerhall’s cabinets are places where animal corpses and skeletons were dissected, analysed, displayed.During the opening performance I tried to be inspired by the room’s history and represent it in some way, interpreting its ‘functional’ memory through movement. I acted as an animal/foetus-like body appearing in the cabinet, my contours slowly emerging from smoke. Stuck in a small space, I tried to free myself while encountering the real witnesses of the event: the eyes of the spectators, the only things that can see and retain memory.Richard Taylor: Riccardo and I were introduced to each other by Holly—we’d never met before. We were shown this space, which was totally empty at the time, and I think from that point on we were very aware that we wanted to keep it quite minimal so that the space could speak for itself. Having seen previous exhibitions here jam-packed full of stuff, I felt that the idea of the glass as a reflective surface was being bypassed; reflective also relating to creating memories or a means of going back to memories. We wanted to leave the place minimal so that reflection became part of the experience. We also considered how the space, divided by these monumental cabinets, can distort how you listen and look at things. These distortions and reflectiveness are both ways of approaching memory, without ever really being able to pin it down. Egyptian and possibly Hellenistic Greek artefacts from GMA A35/1/4/08 Peckover: box marked ‘Peckover Souvenirs’. Courtesy of the Scottish National Gallery of Modern Art Archive. 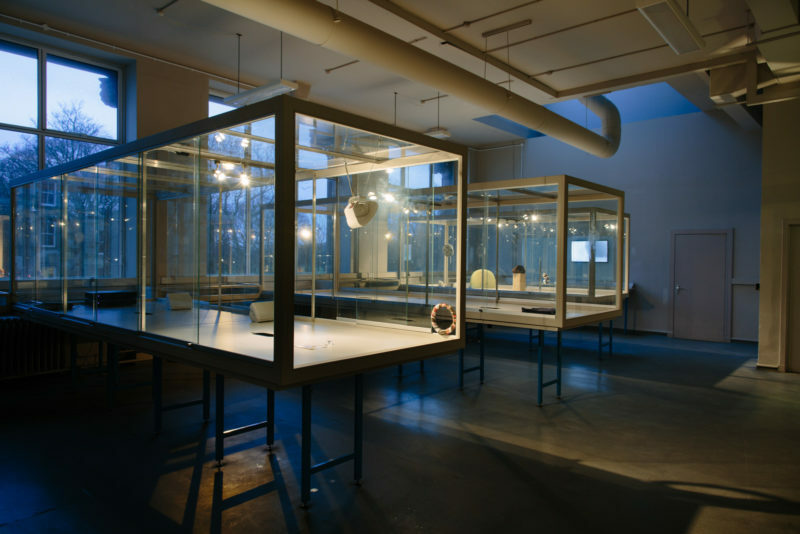 The Laboratory Gallery is a testing-room-turned-gallery-space dominated by three large glass cabinets. CW: I want to find out more about the idea of traces in this exhibition, of presenting something no longer in the space, as in Riccardo’s performance piece. RB: The challenge of this specific setting—an exhibition about memory and movement—was to ensure the medium of dance was always present in the in space without a body necessarily being there. The charm of dance is also its failure: as with any other performing art, dance is ephemeral, movement’s nature is fleeting. 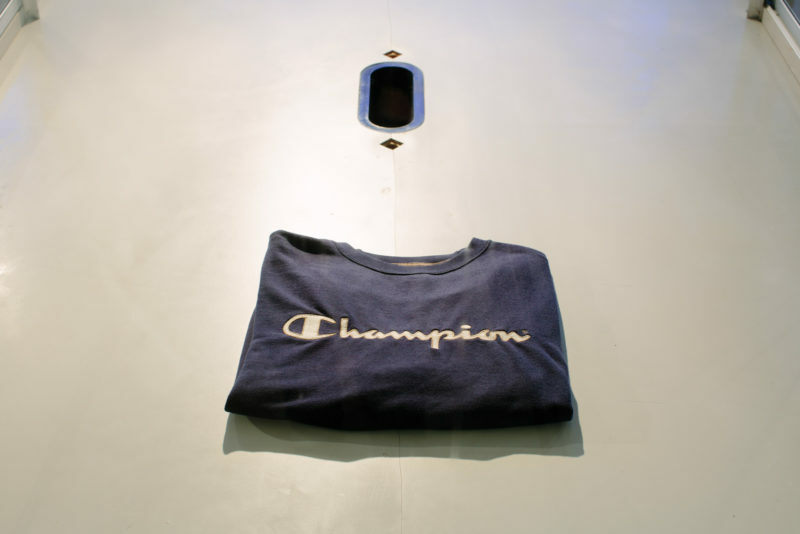 The decision to leave behind the body’s marks from the performance along with a sweatshirt, video and photographs, was made with the intention of reminding the spectator of the performance in a tangible way. 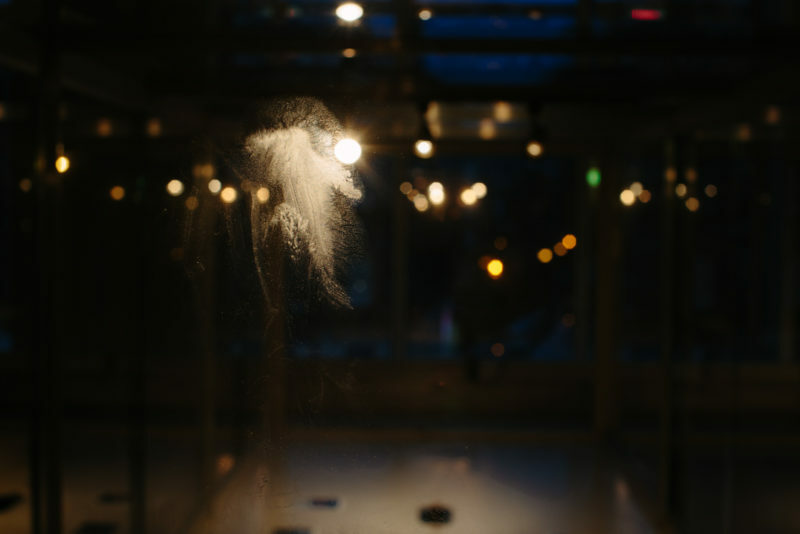 In the last section of the performance I reflect the presence of the spectators on the glass by sliding my fingertips on the inside surface of the cabinets, reinforcing the idea that the performance is connected to an exact time and space and highlighting the importance of the spectator’s gaze, their potential memory. My intervention—and overall contribution to In Parting Glass —is largely based on the uniqueness of that moment.CW: Richard talks about the body as an archive in relation to your dance practice, Riccardo. What do you think of this idea?RB: I love the idea of the body being the archive of our memory, our own history. Our physical scars—and not only the physical ones—relate that history. Where can we keep our most visceral memories—and therefore sensations, feelings—and relive them, if not inside and through our body? What do we belong to if not to our own body and its experience? Where do we come from if not from the history of our flesh? For a choreographer/dancer, this is even more evident, as movement artists deal constantly with making, learning, performing, and remembering, movement through physical sensations. 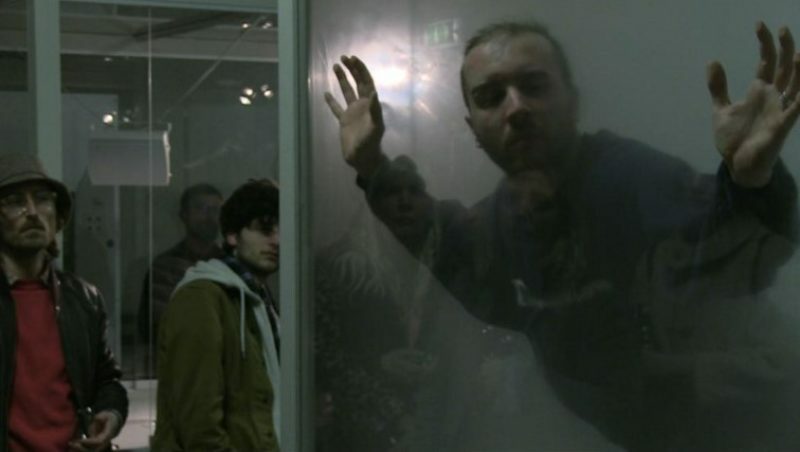 RT: In terms of trace being a part of Riccardo’s performance, you get tactile physical traces of his face being slapped up against the glass. You get the trace which is the jumper he wore during the performance. You get the photographic trace. And you get the marks left on the glass and the floor. It’s subtle. What we were trying to get at with the performance was how the body can exist as a kind of archive and also how his body is this whole set of skills that he’s built over time; learning how to move and improvise. Getting into a confined space here and not like the rest of us having to learn everything to the Nth degree to know what we’re doing next. He could just get in and do it and how his body is trained to do that is quite fascinating. CW: The glass cabinets are referred to as archives in the exhibition. I’m curious about what makes the objects on display archival as opposed to personal. Can you talk a little bit about the differences between a personal collection and an archive in relation to these objects?RT: I’m interested in the kind of threshold that an object steps over in order to become archived. And the formalities and the language and the practice that are embedded in all of that. How does a self-archived collection of your own objects, that mean something to you, then become something meaningful to someone else in an archival setting? Richard explained how he attached a Nivea For Men pendant, which fell off a deodorant bag (that he had with him at the time), to a putty sculpture during install. On the other side of the same sculpture are embedded two faded Tyrozet throat lozenges. A length of Selotape was used to seal the edges of the glass cabinet which Riccardo was performing inside, in order to keep artificial smoke from escaping. This material is displayed, among a series of objects, in one of the glass cabinets. CW: Are you happy with the fact that the viewer doesn’t need to understand all of the stories?RT: I think that people are always going to get things in different ways. It entirely depends on their own histories, or their own memories. So yes. What’s nice is that people come in and latch on to one or two aspects—they don’t feel they have to get all of it, and I don’t think they’re meant to. That’s the whole thing about object display in particular, in museums or archives etc—you go and you make a few singular connections to a few things and you become interested in those things. It’s not about getting the whole picture, it’s about researching or really getting embedded in one or two.CW: I don’t feel it’s a didactic exhibition. You’re not being told what you’re looking at. RT: The first time we met was here—we had a coffee, we had a chat in the park, we realised that we had weird, surface level things in common. Age, sexuality, the same star sign. We’ve slowly realised we’ve got a very similar character. It’s weird—does that come from having very specific beginnings in life? We are both Cancerian, gay, have had life-changing conversations in terms of partners in the same park across the road… How do those trivial commonalities build towards collaboration and how then does that collaboration work? CW: Thinking about that idea of the trivial for a second—those commonalities are trivial but in a way also important. I’m thinking about how you attached the Nivea for Men pendant and how that might seem like a trivial act but has this sense of importance about it as well. RT: I think there’s always a thought process behind things that appear to be trivial.CW: What I’m trying to get at is this idea of cultural seriousness which we attribute to certain objects on the one hand, and how that relates to archival processes of collecting, preserving and presenting, and on the other hand the ways in which we can be serious about objects that are seen as culturally ‘trivial’, like traces… RT: I think that’s how the artist and the archive come together quite well; in some ways it’s the artist’s job to take those seemingly trivial things and make then interesting and respond to them and allow other people to respond to them and think about them. A lot of this has to do with time; it’s almost stretching time out so that people might spend longer thinking about stuff like that, thinking about their own memories and connections to objects. In new social situations where you are trying to find things in common with other people, you start off with quite trivial things. That brings me back to a particular feeling of anxiety. I tried to deal with it in the ‘Aliases for a reason’ story in the sound piece, which looks at the ‘Faerie Castle’, an enclosed environment in which everyone is on the same level, no one’s really in charge and where you must figure out how to place yourself as an individual within that, without being able to look for commonalities with the others. The Radical Faeries of Albion, are the UK contingent of a world-wide movement called the Radical Faeries, which is an alternative gay movement that started in California in the 70s. Its focus is on how the gay community should remain outwith heteronormativity. It therefore approaches anarchistic sensibilities of community, non-hierarchical environments, spiritualistic leanings and pagan origins of the self as part of a homogeneous group. It’s a difficult but, some would say, cleansing environment to be involved in, especially for the full 10 days – you share food, bedrooms, your ideas, your person. Some find it easier to let go by creating a Faerie name, basically an alias that speaks of their affinity to a certain way of feeling. It’s not a rule to have a different name, and it doesn’t happen quick. Some members don’t have Faerie names at all and others grow them slowly as they become more comfortable in the community. R T: The text was written during the research residency in artwriting at Edinburgh Sculpture Workshop in April 2015. That residency was a month after my visit to the Faerie Castle. CW: Where was that?RT: It was in a place near Haltwhistle in Northumberland, North West, on the way to Carlisle from Newcastle. CW: So they take place all over the world? RT: They do, yes. Twice a year The Radical Faeries of Albion have gatherings. People come from all over the world and it lasts 10 days. But you don’t have to go for the full 10 days. CW: do you stay there? RT: Yes, you stay at Featherstone Castle, a building with medieval origins, which sits right next to the River South Tyne. I must admit, I found it weird and isolating even though I was surrounded by people—but there were ways of escaping. CW: Is it expensive? To stay in a castle? RT: If you can’t afford to pay anything, you don’t have to pay anything. If you can afford it, you give more. And you work out how much you owe depending on how long you’re there for. Part of the story in the sound piece ‘Aliases for a reason’ talks of one of the members of the group who acted selfishly and not within the ethos of the community. He was taking money from others for himself, so there was this kind of peak in the otherwise horizontal environment where a decision needed to be made on how he was dealt with. Up until then it was so non-hierarchical that once someone behaved in a certain way, no one knew how to deal with it. The story talks about that as well as other elements. Normally you would do this by asking straightforward questions, for instance, what is your name, where do you come from, what do you do for a job? Silly things like that. 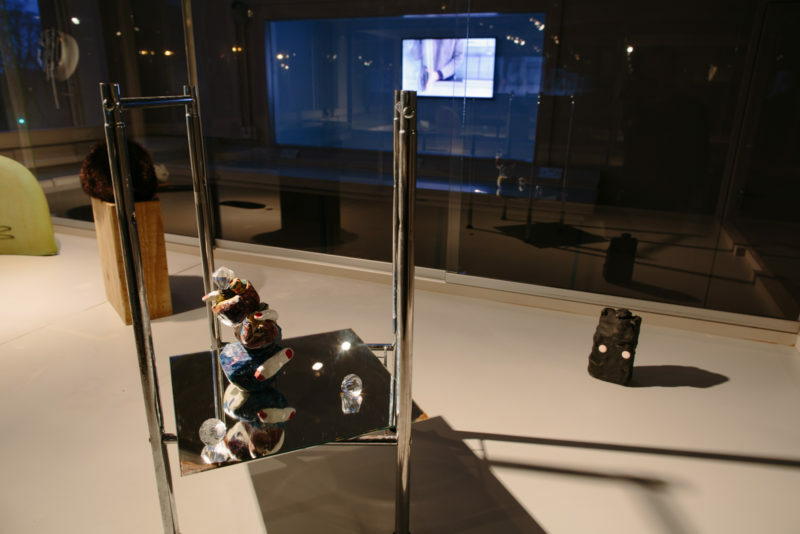 It’s the best to start off a conversation and then develop a relationship with someone.The piece ‘aliases for a reason’ is installed in one of the cabinets which has a slight opening in the glass so that it’s very much about the listener coming close to hear and being in intimate proximity with the speaker. You’re listening to the story almost like an audio book but then as you walk around the space the story distorts.CW: Can you give a hint of what the upcoming performance events on 5 March will entail?RB: During that afternoon the audience will be guided by a mix of movement, live and recorded text, sound and touch with the aim of revealing previously hidden details of the exhibition, as if In Parting Glass, and memory itself, is a mosaic made of multiple tiles. Memory can be an unstable territory. Riccardo Buscarini is an award-winning choreographer and performer who has made works for the stage, galleries and urban spaces internationally. His work reflects on the ephemeral and visceral aspects of existence with an experimental — yet lyrical — attitude. Richard Taylor is an artist and writer currently studying on the MFA programme at Glasgow School of Art. He develops narratives for live readings involving objects and slide photography, writes for paper publication, and makes videos and sculpture with additional voice orientated sound. Image credits from top: Poster image for ‘In Parting Glass’, 2015, courtesy of Riccardo Buscarini, Richard Taylor and Summerhall; Still from opening performance of ‘In Parting Glass’, December 2015. Image courtesy of Rhona Mühlebach; Riccardo Buscarini, ‘In Parting Glass’, detail of installation, 2015. Image © Peter Dibdin Photographer; Riccardo Buscarini, ‘In Parting Glass’, detail of installation, 2015. Image © Peter Dibdin Photographer; Riccardo Buscarini and Richard Taylor, ‘In Parting Glass’, 2015. Image © Peter Dibdin Photographer; Richard Taylor, ‘In Parting Glass’, detail of installation, 2015. Image © Peter Dibdin Photographer.